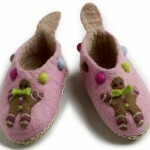 Gingerbread feet are yummy and sweet….okay, these are not edible but they SURE are cute! These are handmade by two sisters in Copenhagen, Denmark. Danish Bohemia has Gingerbread slippers for children and they come in the Pink Gingerbread slipper and Blue Gingerbread slippers. These slippers look so cozy and snuggly that they will keep those little feet warm and sweet! !